It is found only along the South African coast. It keeps to mostly shallow water, is often found in rough surf and sometimes right next to the shore. The Galjoen is a familiar sight for anglers. Its diet consists mainly of red bait (ascidians), small mussels and barnacles. 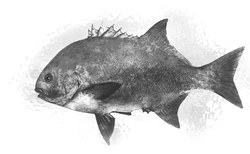 It is also known in KwaZulu-Natal as blackfish or black bream.